Seeing the light; top 8 questions about the light bulb changeover. Posted On: March 24th, 2014 Filed Under: Home energy audit No Comments on Seeing the light; top 8 questions about the light bulb changeover. 1. Which bulbs are discontinued? 40 watt, 60 watt, 75 and 100 watt incandescent bulbs plus the T12 and T8 flourescent tubes used in overhead lighting. The new generation of energy efficient LED, CFL, (HE) high efficiency incandescents and deluxe fluorescent bulbs will fit in your existing fixtures. While it might freak you out to pay up to $7.50 for a light bulb, the payback in energy savings and longevity makes up for that. 2. What will I see in energy savings? Studies say that changing out 15 standard bulbs for one of the more efficient options will save you $50 per year on your electric bill. * That could be $50 million for Seattle area residents**. 3. What are these new 40 or 60 watt incandescent bulbs at the store? These are typically labeled HE, for high efficiency. The high efficiency incandescent has a filament that is insulated by a gas to reduce heat loss, but will retain the visual light you are familiar with from current bulbs. These new bulbs will save energy, can be used with a dimmer switch, and provide familiar color. 4. Is this ban of incandescent bulbs only in the US? No. Governments around the world are supporting this initiative. George W Bush signed the US bill into law in 2007. 5. Why legislate a change in light bulbs? 6. What about light bulbs that are used in grow lights for seedlings? LED grow lights provide superior performance as they deliver more light output with less energy and heat production, and have a much longer useful life than current fluorescent or incandescent lamps. LEDs can be made in different colors to mimic the ranges of natural sunlight that drive maximum plant performance. These use standard bulb fittings, so they can probably fit into your existing grow light equipment. They come in a variety of wattages. 7. 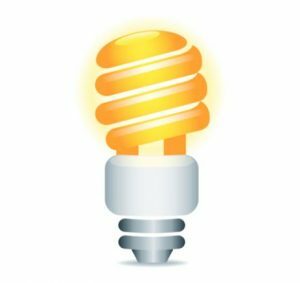 Should I use a CFL (compact fluorescent lamp) or an LED (light emitting diode), they both save energy, so what is the difference? LED is our strong recommendation, and we suggest you turn down free CFL’s except for use as porch lights. a. LED’s provide many benefits and prices are coming way down. They last longer than halogen or CFL bulbs, which is why they are used in headlights and TVs. b.Importantly, LED’s do not have the toxic aspects of the CFL. The CFL bulb, while efficient, contains toxic mercury and disperses unsafe amounts of UV light. You cannot throw away a CFL bulb in your regular trash. Studies by reputable universities have determined that it is harmful to sit under a CFL bulb for extended time as the UV radiation can be detrimental. c. The quality of light from either LEDs or Halogen bulbs is better than most CFLs. The CFL’s take time to warm up and share their light, plus most types cannot be used in a dimmer. The light that comes from these bulbs is not the same color as your current conventional bulb. It’s harsh… like turn on the lights in a bar at closing time harsh. 8. Are all incandescent bulbs going away? The regular sizes mentioned are when retailer inventories are depleted, but specialty sizes such as appliance bulbs (for inside of your range hood or refrigerator), decorative fixture bulbs, 3 way bulbs, and other specialty bulbs will still be made. Washington Energy Services has provided tailored energy saving solutions for Puget Sound area homes since 1957. For the best in energy saving products and services, call 800-398-4663 or click for more information. * Reference: EnergyStar, Lighting choices to save you money, 2013. ** Based on an estimate of 1 million homes and apartments in Seattle and surrounding area.